The idea of sustainability, or ecological design, is to ensure that our use of presently available resources does not end up having detrimental effects to our collective well-being or making it impossible to obtain resources for other applications in the long run. Following its destruction by a tornado in 2007, the town of Greensburg, Kansas (United States) elected to rebuild to highly stringent LEED Platinum environmental standards. Shown is the town's new art center, which integrates its own solar panels and wind generators for energy self-sufficiency. Building Information Modelling BIM is used to help enable sustainable design by allowing architects and engineers to integrate and analyze building performance.. BIM services, including conceptual and topographic modelling, offer a new channel to green building with successive and immediate availability of internally coherent, and trustworthy project information. BIM enables designers to quantify the environmental impacts of systems and materials to support the decisions needed to design sustainable buildings. ^ shamilton. "Module Pricing". Solarbuzz. Retrieved 2012-11-07. ^ "Solar Water Heaters". Toolbase.org. Archived from the original on 2013-04-15. Retrieved 2012-11-07. ^ a b c d e John Randolph and Gilbert M. Masters, 2008. "Energy for Sustainability: Technology, Planning, Policy," Island Press, Washington, DC. ^ GUMBEL, PETER (4 December 2008). "Building Materials: Cementing the Future". Time – via www.time.com. ^ Jonkers, Henk M. (23 March 2018). 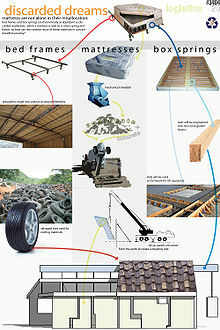 "Self Healing Concrete: A Biological Approach". Self Healing Materials. Springer Series in Materials Science. 100. Springer, Dordrecht. pp. 195–204. doi:10.1007/978-1-4020-6250-6_9. ISBN 978-1-4020-6249-0. 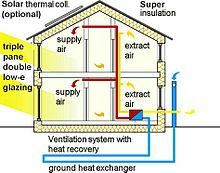 ^ James, J.P., Yang, X. Indoor and Built Environment, Emissions of Volatile Organic Compounds from Several Green and Non-Green Building Materials: A Comparison, January 2004. Retrieved: 2008-04-30. ^ Contreras, Jorge L.; Roth, Hannah; Lewis, Meghan (1 September 2011). "Toward a Rational Framework for Sustainable Building Materials Standards" – via papers.ssrn.com. ^ "U.S. Green Building Council". ^ "ENERGY STAR - The Simple Choice for Energy Efficiency". www.energystar.gov. ^ Mark Jarzombek, “The Disciplinary Dislocations of Architectural History,” Journal of the Society of Architectural Historians 58/3 (September 1999), p. 489. See also other articles in that issue by Eve Blau, Stanford Anderson, Alina Payne, Daniel Bluestone, Jeon-Louis Cohen and others. ^ McGrath, Brian (2013). Urban Design Ecologies: AD Reader. John Wiley & Sons, Inc. pp. 220–237. ISBN 978-0-470-97405-6. This page was last edited on 8 April 2019, at 10:49 (UTC).